Redwood Super kits offer custom-built quality at off-the-rack pricing. Mix and match your own design or let our experts design it for you. 36- 1/16"H x 27-11/16"W x 8-3/4"D.
Redwood Super kits offer custom-built quality at off-the-rack pricing. Mix and match your own design or let our experts design it for you. Can this rack be stacked with another? BEST ANSWER: I wouldn't. It's not very strong. I have a 31.5" wall space X 90" tall can you build a rack to fit in medium to light oak ? BEST ANSWER: Yes it would be best if you called to discuss this space and the options at 800-356-8466 . We are happy to help figure it out. what do I need to attach these to the wall? BEST ANSWER: These will come with mounting hardware (2 angel bracket & screws) to attach to the wall. Did not matter whether you used screws or nails for construction wood would split. Unable to use and a complete waste of money. Perfect addition to the wine cellar! This is a basic wine rack. Not as deep as some wine racks so it is not as good in earthquake country. The assembly directions need to be more detailed concerning placement and layout of cross members. This rack is suited for basic storage and not as a show piece in the Dinning Room. On the other hand the price is very reasonable. Contrary to some other reviews, all the racks in this line are good, but they are not free standing. All of mine are mounted wall to wall, floor to ceiling, and attached to studs in the walls. 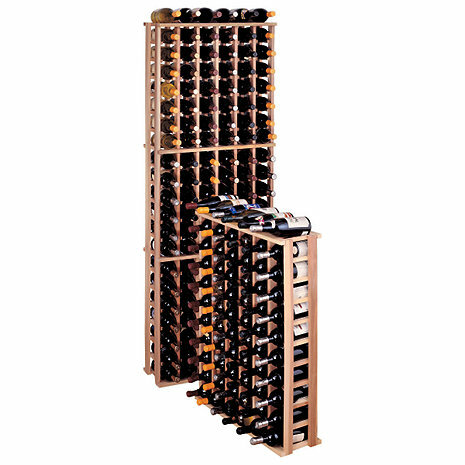 I have 1480 bottles, and these racks, if installed carefully and correctly, work just fine. These work well installed in wine cellars, wall to wall. I do wish that they still included the #6 square drive screws instead of finish nails, but you need to pre-drill holes for screws to not split the wood. I now have as many racks as possible installed in my cellar.